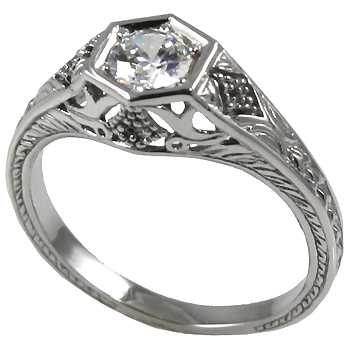 Stock #A102:1/2 Carat CZ Antique/Deco solitaire Ring. 14K White Gold, Reproduced with Beautiful, Hand-Crafted, top quality Jewelry workmanship!... (These Russian CZs are more precisely cut & polished from the finest quality CZs) Satisfaction Guarantee! Picture does not do justice to this piece!